According to our latest report, 84% of marketers have a deliberate strategy for building backlinks. Here are the tactics that are working best. For companies reliant on content marketing as an acquisition channel, backlinks are still one of the most important elements for improving overall visibility. It’s still one of Google’s top ranking factors, which means marketers will continue to value inbound links (albeit, to a fault in many cases) above all else. 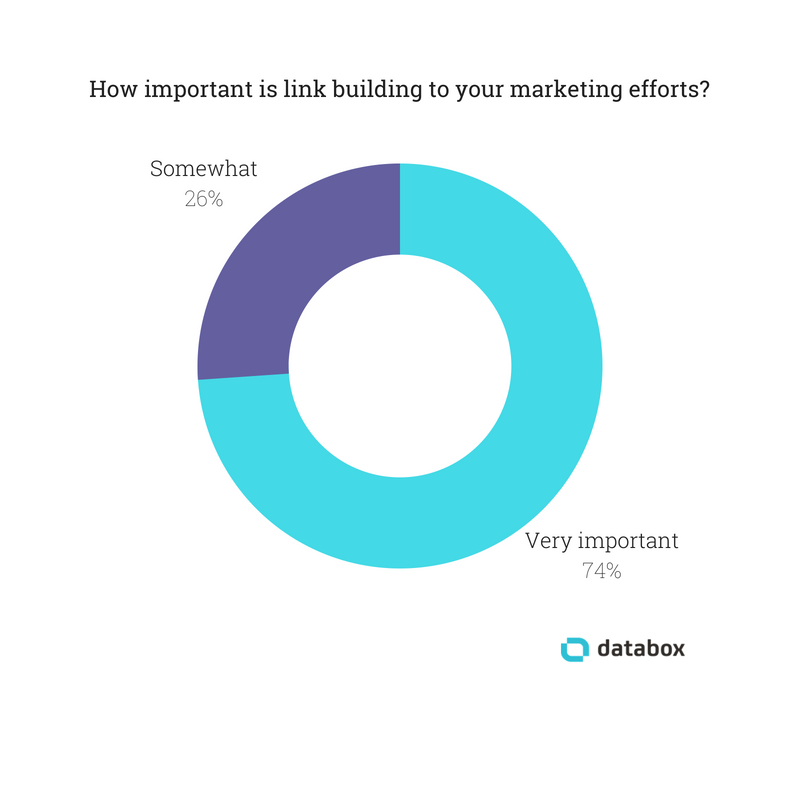 In our latest report of over 100 marketers, 74% say link building is very important to the success of their marketing. Okay, so it’s very important. We figured, but we needed to validate it before we made that assumption. But, the things marketers deem important aren’t always reflected in their strategy. In other words, marketers may say that link building is an important exercise, but how many of them actively executing on this? 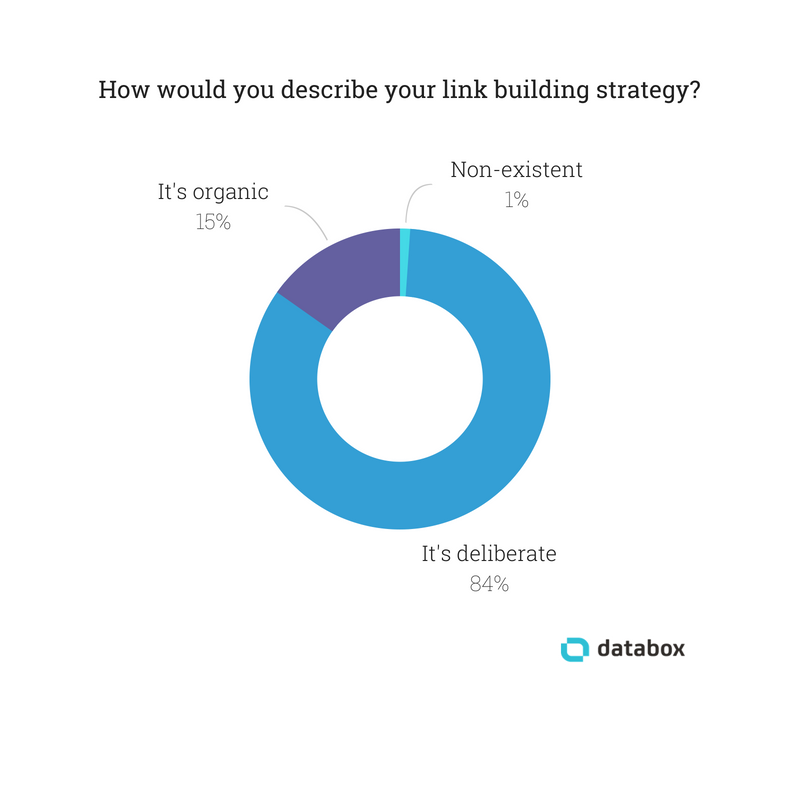 Turns out, 84% of marketers say that their link building strategy is deliberate, meaning they aren’t relying on others to simply find and link to their content organically. They’re actively making it happen. Well, there are a lot of opinions on the subject. So many, in fact, that this is our biggest report yet. We had over 100 responses to our request for comments, and while we couldn’t include them all here, we’ve included a ton of great advice. To make it easier to read, we’ve broken down all responses into 7 distinct categories. Editor’s note: Here’s a good way to prioritize which content to pitch to potential partners and publishers for backlinks – start with the pages already driving high click-through-rates in search engines. Grab this free Google Search Console template and see which pages on your website would be good starting points. Unsurprisingly, a large number of marketers suggest building links by creating great content. It’s not a shortcut, and it’s nothing revolutionary. But it’s the best link-building strategy out there. We also got a few cool success stories from marketers telling us the kind of content that helped them get backlinks to their site. While the post hasn’t been a high-converting one, adds Thompson, it’s been a fantastic link-building resource. NHCPS has gotten two .edu links and a great deal of referral traffic. Text Request marketing director Kenneth Burke shard a similar story. “We asked, ‘What is something related to our industry that would be valuable to others writers, and that they search for a lot? '” The answer, they decided, was text messaging statistics (Text Request is a B2B text messaging software company). Text posts can obviously be valuable. But we had a few people tell us that their visuals were most effective in earning backlinks. Auto Accessories Garage built an interactive map that shows where traffic in the United States is slowest and fastest. By using data from the Census Bureau, the company showed users how slow or fast the commutes are in different parts of the country. Jim Milan, communications and organic search manager, also shared his promotion strategy: “We then shared this piece of content on the Data is Beautiful subreddit,” where it earned many upvotes. Those upvotes got it in front of writers at major publications. Jon Tavarez, head of growth at FLUX, told us that he did something similar with an infographic. By placing users first and not focusing on promoting the company, he was able to land over 100 backlinks and get the graphic shared to massive audiences by influencers like Guy Kawasaki. Several of the marketers above recommended pulling data from publicly available sources. But quite a few others recommended collecting your own primary source data to create link-worthy content. “One link building strategy that has worked extremely well for me is publishing my own research,” says R.J. Weiss, founder of The Ways to Wealth. Interestingly, Weiss says that the research doesn’t need to be complex or exhaustive—just original. This simple tactic earned him links from some of the biggest financial sites around. Nishank Khanna, CMO at Clarify Capital, got links from Forbes and Entrepreneur magazine by running a survey and using the data to create a large content piece with an infographic. They provide new, original information rather than reiterating familiar claims that aren’t backed up by research. Their reports provide genuinely helpful insights into best practices and trends that are relevant to small business owners. They invest time and money into producing content, recognizing that valuable editorial contributions can’t be rushed to publication. Investing time and money in original, in-depth, genuinely helpful editorial content, says Delgado, is the best way to help Clutch’s audience and get links. A classic link-building tactic, roundups, continues to work. One final note: you don’t need to interview celebrities. Alex Robinson, general manager at Team Building Hero, says you don’t need to talk to Elon Musk or Bill Gates for this strategy to work. In fact, he adds, it may be better to interview people that are well-known in your specific industry. Since then, though, he’s changed his ways. Invite them to contribute directly as a subject-matter expert. Quote/link to their article with their permission, and then let them know about it after it’s live. Include them in the research process. Before committing to the article, ask the prospect if they would find a guide on the topic useful, and what they would hope to learn from it. 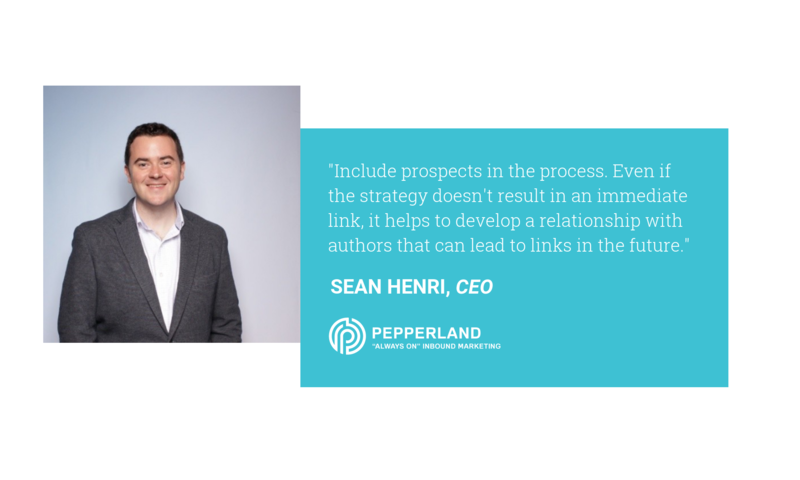 Even if you don’t get a link, says Henri, you’ll build a relationship. And that’s even more valuable. Building new links is great. But you can also get some value out of old links. Or ones that never existed in the first place. The conversion rates are near 100%. If you can’t get the link updated, you can often implement a 301 redirect and reclaim most of the link credit. You don’t have to persuade—the intent to link is already there. With unlinked mentions, often the author meant to link your brand name or URL but simply forgot. You’re increasing the ROI of past marketing efforts without investing more in a link-building campaign. It’s tough to top that. “There are many instances in which your brand is mentioned online without a backlink to your domain,” says Matt Zajechowski, outreach team lead at Digital Third Coast. You can keep an eye out for these mentions with Google Alerts (Zajechowski recommends putting your search queries in quotes). When you see a mention that isn’t linked, send an email asking for a link back to your site. Happy Monday! I saw that you shared the (unlinked resource) over the weekend in your article about (subject of the article). Appreciate the share! I’ve shared on my social channels this morning and will continue to do so throughout the week. One small request. Is it possible to include a direct link to the study (include the link to your resources) in your article so that your readers could see the full results of the study? Let me know if this is doable. Thanks again!! It’s an easy, but remarkably effective, link-building strategy. Lux gives the example of “integrated inbound” at LyntonWeb. It’s a specific process they use, and by finding mentions of it online, they can earn backlinks. There are a huge number of broken links out there. And chances are that you can help fix some of them—by convincing someone to point them to your website. All you need to do is find a link that points to a 404 page, email the webmaster, and let them know that their link is broken. Recommend that they link to a relevant piece of content on your page, and you’ll have a new link. Once you’ve identified the link, you can reach out and suggest linking to a piece of content you’ve already created, or you can create something new for the purpose. One great thing about this strategy is that both parties benefit. “Your target site no longer has a broken link/SEO error, and you now have a reputable backlink to your site!” And, even better, you might be able to find other sites linking to that 404 page. Even more backlink potential. Simon Rodgers from WebSitePulse recommends looking specifically at your competitors’ 404s. Once you find moved or non-functional pages, check their backlinks. Then reach out to the linking website with your content. Find websites in your industry that have changed names, moved to a new URL, stopped offering a service, stopped updating a resource, or shut down. Find links pointing to the old URL using your favorite backlink tool. Reach out to site owners giving them a heads-up on their outdated link and suggest they link to your resource. Site owners should be happy to update their page with your link. There’s been a lot of discussion over whether guest posting is still a viable link-building strategy. But if our marketers are any indication, it’s still a great method. Focusing on quality will not only get your guest post accepted but help you build a reputation. A few of our respondents pointed out some specifics that are worth mentioning. For example, Jonathan Aufray, co-founder of Growth Hackers, mentioned that most guest post opportunities come with one link in the body of the article and one in your bio. Which means you may be able to link back to your homepage and an internal page, like a high-value blog post. Todd from EveryoneSocial also pointed out that not all of your links will be “follow” links. But sometimes that’s okay. It can still build a solid amount of referral traffic. No matter what the specifics are, it’s a good idea to know the details ahead of time. Remember that site owners aren’t going to give you a guest post just because you asked for one. You have to give them something that adds value to their site. If you can save someone some work, you’ll be successful in your guest-posting endeavors. Every high-Domain-Authority blog gets a million guest post requests every day. But what if you offered something different? If you have the skills to do so—or know someone who does—it’s a great strategy to stand out from the crowd. If you’re not subscribed to the Help a Reporter Out (HARO) email newsletter, you’re missing out. Using it was one of the most common pieces of advice from marketers on how to build more links. Not familiar with HARO? It’s a service that lets journalists and content creators ask questions of experts in particular fields. Pupford more than doubled their backlinks in three months, according to marketing manager Devin Stagg. And Jackie Tihanyi, digital marketing specialist at Fisher Unitech, reports a 30% traffic increase since starting to use HARO. To get featured in a publication like INC, though, you’ll need to earn it. “Experts earn media coverage,” says Donna Duncan, owner of B-SeenOnTop. You might be tempted to respond to as many HARO requests as you can. But it’s important to “make your responses unique and fresh for each one,” says Ben Walker, CEO of Transcription Outsourcing. A huge number of requests go through HARO every day. It’s easy to get overwhelmed if you’re not selective. There are many categories to choose from. You can also get alerted when specific types of requests come up. “We’ve had great success by setting email rules so HARO digest emails containing strategic keywords go to our primary inbox,” says Get Found Madison founder Eagan Heath. While HARO is the most popular service of this type, there are others. Nelson Jordan, co-founder of Agency Match, also uses Sourcebottle and JournoRequests. It’s worth experimenting to see which is best for your link-building efforts! Many link-building strategies are built around old-fashioned public relations. Reaching out to people who you think might be willing to link back to you is a time-honored method of getting more backlinks—and while it has gotten harder, it’s still a great tactic. 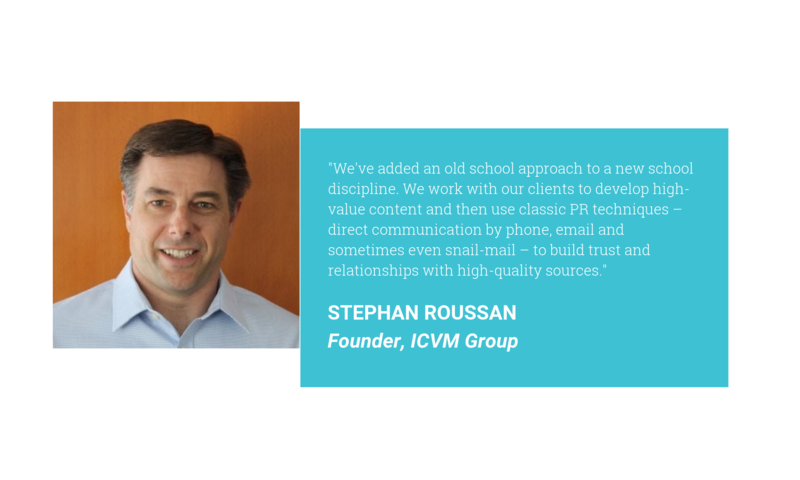 “What we’ve done is added an old-school approach to a new-school discipline,” says Stephan Roussan, president of ICVM Group. His team uses direct communication by email, but also reaches out by phone and sometimes even snail mail, to build relationships with potential link partners. When doing PR, it’s important to remember what you’re aiming for. “Ultimately, PR is meant to help your brand by appearing on Google’s search results in the news section,” says Oz Chowdhury, marketing executive at Powerphrase. 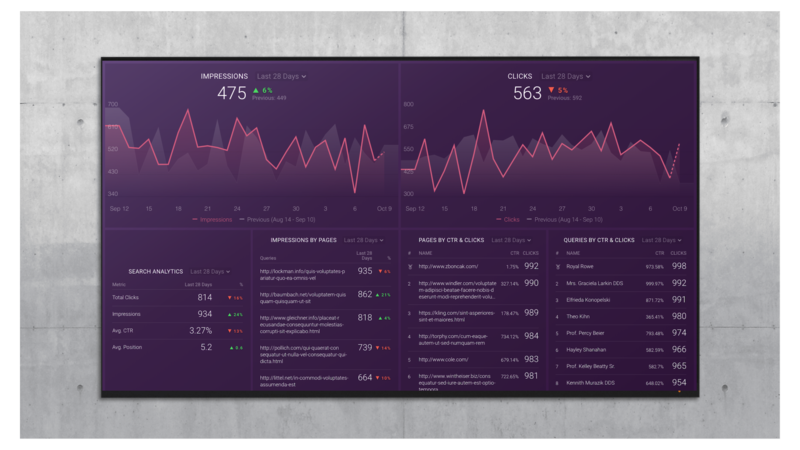 By monitoring current trends, your PR team helps your company join important conversations. And, of course, build backlinks. Link-building outreach has a reputation for being spammy. And rightly so. A few respondents told us how they solve that problem, and it’s with one simple tactic: relationship-building. “Simply having a conversation” with people who run relevant businesses and websites is a great way to build links, says Lauren Petermeyer, editor-in-chief of Morethanglam. “Approach it as a human talking to a human about how to help build up each other’s business.” That’s much better than traditional low-quality outreach. You can also get more tactical with your relationship-building. Crystal Xue, content marketing specialist at Zenlayer, look for high-quality backlinks that her competitors have earned from media outlets. Then she builds relationships with journalists there. “The earned coverage from these backlinks usually garners attention from more media sites and business partners, and really sparks conversations.” And that means the process gets easier as you continue. “Constantly looking for digital PR opportunities for our own agency has been a 100% free and super effective link-building method.” Who can argue with that? Brandon Loures, founder of Brandlift, says that his company started by getting featured in podcasts and doing interviews for articles. Brian Schofield, search engine marketing lead at Trailblaze Marketing, told us you need to be quick. By showing that you respect their time, you’ll be likely to catch their attention. You may want to reach out only to bloggers and other content marketers. But you’d be missing out on valuable opportunities, says Travis Reynolds, director of media relations at content marketing at Crum & Forster Pet Insurance. Print publications and—especially in B2B—trade publications give solid backlinks for sources. If you or an executive at your company can get a mention, you’ll get one of those links. These come as no surprise. They let you answer people’s questions. And that’s what content marketing is all about! Building great links is all about standing out. Maybe it’s by creating content that blows everything else out of the water. Or reaching out to content creators with emails that jump out of their inbox. As you can see, there are as many effective methods of link-building as there are companies. And more. It might be as simple as sending an email suggesting your content. Or it could be as complex as building an entire content operation around expert opinions. No matter what you decide to do, your backlink strategy is important. Try different methods. Be creative. And be sure to bookmark this post so you can come back to it when you want to build more links. Share your favorite link-building tactics in the comments! We’d love to hear from you and chat about building links.